Matching roof shingles isn't easy. Especially when you are trying to match a pink roof! 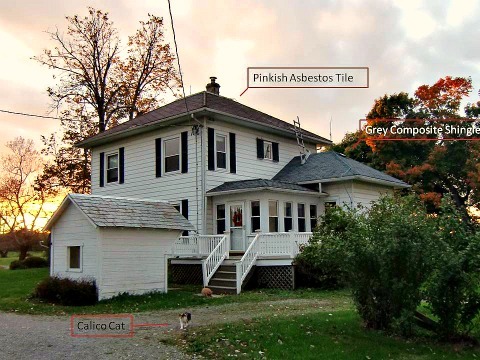 This is the story of my two -year search for shingles to match an existing flat, pink asbestos shingle roof. If you have ever built a house or put on a new roof you will know there are a tremendous number of choices, both in terms of material and color, so it should have been a quick, easy task. My house is a Foursquare farmhouse built in 1906. For roof shingles it uses an asbestos shingle, sometimes known as transite tile. At some point a kitchen extension was added but the roof shingles used on the kitchen were totally different and therein lies the problem. I am not sure what they originally used to cover the kitchen roof, but when I bought the house it had recently been reroofed with a gray asphalt shingle. When I bought the house I could not figure out why anyone would choose to match the gray shingle with the pink tile. As it came time to replace the roof shingles and I began my search I discovered the reason. It is a hard color to match. It sounds awful. Pink tile. As my tile photo shows the reality is a little different. There is a fair amount of gray to the pink, and some amount of lichens or moss have grown on the tile so the overall color seems fairly neutral and natural. I started my search thinking I would try to replace the asphalt shingle with something permanent in nature. My transite tile is over a hundred years old and still going strong. Any kind of composite shingle is going to last 30 years at the most and more likely will need to be replaced after 20 years. I sold a house in Tulsa, Oklahoma that was only 12 years old. The roof shingles were just starting to show a little curl on the edges, but it should have had several years of life left in it. I was forced to replace the roof shingles in order for the house to qualify for a loan, because the insurance companies would not insure a house with a roof in that condition. So, at least in some states, many roofs have to be replaced well before the life claimed by the shingle companies. Since I was trying to match an old asbestos tile I tried finding a flat, concrete tile that might match the shape and color. I could not find such a thing. When asbestos was essentially banned in the 1970’s the roofing companies tried to replace asbestos with other fibers. The new tiles failed. With asbestos you could have a tile that was both flat and thin, similar to slate, but stronger. The replacement fibers did not work well and the tiles were swelling and cracking and had to be replace in a few years. Asbestos shingles are mostly cement and you can find cement tiles today, but they are much thicker and heavier. I looked at all the cement tiles I could find. I could not find the exact shape, but I did find some that had a color that would not be too far off of my pink. I even ordered some samples. What I discovered was the thickness of the tile was going to create a very different look on my roof. For that reason alone I would have searched elsewhere, but the real show stopper was the weight. The cement tiles were going to be much heavier and my kitchen roof is lightly framed. I was going to have to reinforce my roof in order to use the cement tiles. Above is one of the samples I received from Eagle Tile. It looks like a great product, but would not have worked for my roof. Next I considered clay tiles. Clay tiles are a great product and they also last forever. They weren’t as thick as the cement tiles, nor quite as heavy, but it was possible I would have to beef up my roof. I never got that far in my evaluation of the tile because I could not find a good color match. Clay tends towards orange. I did not want that. It also is much darker than my pink tile. I could not find an existing clay tile that was going to be a significant improvement in color match. Slate was out simply because there aren’t any slates that are anywhere near my pink. I have slate on my garage and another outbuilding. In my desperation I did consider try to match that slate, but it would have still left me with a mismatch on my house. A metal roof was my next choice for consideration. I initially looked at the stamped metal roof shingles that attempt to replicate slate or shakes. There are some decent looking products out there, either in steel or aluminum. They don’t last as long as clay tiles, but they will probably last 50 years with limited maintenance. As time wore on I expanded my search to standing seam metal roofs. These are the traditional metal roofs found on old farmhouses. The problem with metal roofs was again the color match. The metal roofing products all get painted at the factory and the quality of the paint is important to the longevity of the product. The companies offer a limited number of colors. They do offer red roofs. I could find bright red roofs and I could find dark red roofs. I could not find anything resembling pink. I did consider painting the metal to match, but I decided I would end up with a bunch of paint that was peeling off. Even if the original paint held, and the metal was still protected, peeling paint would look bad and mean more work for me.It took me several months to work my way through the permanent roof options before I gave up. Started in the spring of 2011, thinking I would replace my roof that summer. I ended up in late summer throwing my hands up in the air in disgust and deciding that my roof would last another year. Over the winter and through the spring I did look at my options in the world of synthetic, plastic roof shingles. These are flat tiles that usually resemble slate or wood. They are made of either virgin plastic, recycled plastic or recycled rubber. They have a mixed history. The early versions tended to curl up or crack and most of the manufacturers went belly up. The current crop is probably better and the tiles are all warranted for around 50 years, but that won’t do you any good if the new batch of companies go belly up. Still, I was intrigued by this type of tile. I had to admit that they looked really good. Once again, the problem was color. No one is trying to capture that miniscule pink tile market. That market seems to consist of me and a few old ladies in Florida. Well ladies don’t give up because there is a happy ending to my story. By the time mid-summer came around I had abandoned my search for a long-term tile and focused my efforts on composite roof shingles. With numerous manufacturers making what is almost a commodity product I thought I would hit pay dirt easily. It turns out that the various companies all make the same colors. There are numerous browns and grays that look nearly identical. There is a much more limited range of reds, but they all tend towards the darker reds. It wasn’t until late summer that I decided I would have to compromise and go with something that was not going to match the pink but would complement the pink. Thanks to the internet you can search for all the colors that the manufacturers have to offer, but you have to be wary. The colors on your screen may not match the colors on your roof. You need to look at actual samples. I started a list of all the colors that would seem to be a reasonable complement to my existing roof. Mostly these were dark red. I identified who sold these products and what stores where nearby so I could go to the stores with a tile in hand and evaluate which I should buy. One thing I discovered was that not all roof shingles were available locally. A lot of shingle manufacturers will only produce certain colors at certain factories and they won’t market those colors outside of a certain area. You could probably special order these colors from outside your area, but finding a sample might be impossible. It turns out that red roofs are much more popular in the South and the West and difficult to find in the Midwest. However I did find a few that I could evaluate. When I finally started digging through the sample boards at the hardware stores I was delighted to discover one pink shingle. I really found it by chance because I was concentrating my search on dimensional roof shingles. This color was on a three-tab shingle sample board. I only found my color because all the sample boards of roof shingles were jumbled together and I had to sort through the piles. Certainteed makes a fiberglass three-tab shingle called XT25. XT stands for extra tough and 25 is for the 25 year warranty. The color I found is called Coral Frost. It is actually a mixture of red grit and white grit. I had missed it because the internet photo looked mostly white and did not accurately portray the color. It wasn’t a perfect match. It would be lighter than my asbestos tiles. They tended toward the gray and my Coral Frost tended toward the white, but it was worth a deeper look. It was early September by the time I brought the sample board home and compared the color to my actual roof. It is a difficult task to compare a roof to a sample that is 2 inches by 4 inches. It takes some imagination to project that color onto your roof, but it was a necessary task. When I had describe my find to my wife she was skeptical. It sounded like Pepto-Bismal to her. The poor quality of the internet photo did not reassure her. It was only when I showed her the sample that she agreed that it would work. In retrospect I had one option that I did not consider at the time. The mixture of grit on my Coral Frost shingles inspired me, so my inspiration came too late. I could have installed a red metal roof, and then used a light spatter technique to add white drops of paint to the roof. Even a white spray paint applied lightly and from a distance could create a pixilated mixture of colors similar to the mixture of grit on my fiberglass shingles. Some of the little dots of white paint would flake off over time, but dots would not be connected so you wouldn’t have large swaths peeling off. It is a technique to consider if you ever have to match metal roofs.